In this article, we introduce a novel three-step approach for solving optimal control problems in space mission design. We demonstrate its potential by the example task of sending a group of spacecraft to a specific Earth L 2 halo orbit. In each of the three steps we make use of recently developed optimization methods and the result of one step serves as input data for the subsequent one. Firstly, we perform a global and multi-objective optimization on a restricted class of control functions. The solutions of this problem are (Pareto-)optimal with respect to ΔV and flight time. Based on the solution set, a compromise trajectory can be chosen suited to the mission goals. In the second step, this selected trajectory serves as initial guess for a direct local optimization. We construct a trajectory using a more flexible control law and, hence, the obtained solutions are improved with respect to control effort. 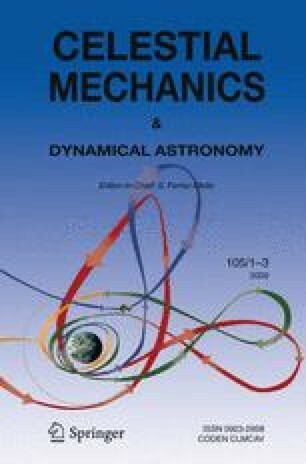 Finally, we consider the improved result as a reference trajectory for a formation flight task and compute trajectories for several spacecraft such that these arrive at the halo orbit in a prescribed relative configuration. The strong points of our three-step approach are that the challenging design of good initial guesses is handled numerically by the global optimization tool and afterwards, the last two steps only have to be performed for one reference trajectory.